Samsung ended 2011 with a bang: On Friday it reported record profits for its fourth quarter of 2011, 5.2 trillion won, or $4.5 billion. A chunk of that was from a onetime boost it gained from selling its hard-drive unit to Seagate. But its bottom line is also being helped by selling 300 million phones this year and its continued reign as king of Android (s GOOG) phones. Though Samsung doesn’t report specific numbers, analysts are estimating the company to have sold between 32 and 35 million smartphones between October and December, according to Bloomberg. That’s a heck of a lot of smartphones, and it shows Samsung’s momentum in this area is only increasing, as customers are responding to the company’s Galaxy lineup of phones. As I wrote back in August, it’s very clear that the battle for mobile supremacy is still very much a match between just two players: Samsung and Apple. (s aapl) Now that we have a rough idea of how Samsung fared in smartphone sales this year, it’s a good time to tally up total smartphones sold by Samsung and total iPhones sold by Apple in 2011. First a quick note on the math: To make the numbers line up accurately, we will count Apple’s second, third and fourth fiscal quarters, which cover Jan. through Oct. 31, 2011. That will line up on the calendar with Samsung’s first, second and third quarters, which cover the same time period. Numbers for Apple’s fiscal first quarter of 2012 — which corresponds to Samsung’s fiscal fourth quarter — won’t be released until Jan. 24. 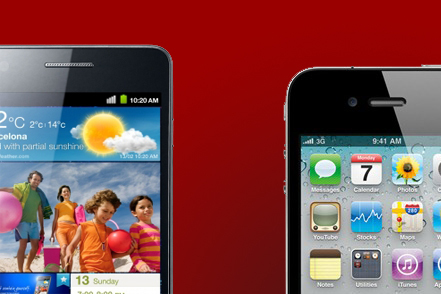 January through March, Apple sold 18.65 million smartphones; Samsung sold 12.6 million. April through June, Apple sold 20.34 million smartphones; Samsung sold an estimated 19 million. July through September, Apple sold 17.07 million smartphones; Samsung sold somewhere between 24 and 28 million. October through December, Apple hasn’t officially told us yet, while it is being estimated that Samsung sold between 32 and 35 million smartphones. So that means that Samsung has sold somewhere between 87.6 million and 94.6 million smartphones in the calendar year 2011, though those are estimates, because halfway through the year Samsung stopped reporting exact figures for smartphones sold. Estimates for Apple’s October through December sales have been fluctuating since the iPhone 4S debuted in mid-October. The most recent analyst estimates say Apple may have sold anywhere between 30 million and 43.6 million iPhones during the quarter. Doing the math, that means Apple may have sold anywhere between 86.06 million and 99.66 million iPhones during the calendar year. In other words, it’s going to be very close. Apple execs have already said to expect a monster quarter for the iPhone when the company reports its results in a few weeks. Whether Apple ekes out a victory over Samsung in smartphones sold for the year probably isn’t high on the company’s list of priorities, as long as the company keeps adding billions to its cash pile every quarter. Have used both iPhone and Samsung… and really, Samsung lacks a lot in terms of making the entire handphone experience efficient and convenient for users – from purchase to after sales service. It feels like you’re just purchasing another phone with Samsung, whereas with Apple, you know there is so much value attached to the product that you are holding in your hands. I have used both, but since my new cellphone samsung galaxy s2x lte, believe me you dont want to go back to iphone. Anyone can give away something. Look at Amazon’s tablet. People that purchase iPhones want elegant, leading technology, great designs, easy to use, virus free, innovative, simple, reliable and feature rich products. Google music is a joke as are all of their “cloud” services. Samsung is doing well after launching its galaxy series phones and releasing phone with android OS.We know the older phone from samsung are all slide phones and etc.But samsung needs to improve after sales service in providing updates to their phones properly. Samsung has phones running, Android, Windows Phone 7, and their own home grown Bada (a smartphone version of their featurephone OS). How many more OSes do you want Samsung to have? WebOS? Samsung already has smartphones based on Android, Windows Phone 7, and Bada, a home grown OS. What else do you want them to add, WebOS? “as long as the company keeps adding billions to its cash pile every quarter” …. not willing to be equally as scathing to Samsung.